This has been an interesting year for anyone trying to follow the upcoming changes to charter halibut limits for 2018. The International Pacific Halibut Commission (IPHC) has been uncharacteristically deadlocked in determining halibut size limits for the 2018 fishing season. In February, a 35-80 inch slot was proposed to keep the numbers within a sustainable range. Halibut over 35” would need to be released. While the sustainability of the fishery is of utmost concern for most fishermen, this cut in size limit would hurt, as lots of the halibut we catch fall within that size range. Fortunately, as of now, the commission has decided on a 38-80 inch slot for 2018, giving Ketchikan charter fishermen an additional three inches. A three-inch difference might not seem like a lot (it equates to about a 5-pound difference in weight), but it is a big deal. Our average halibut length is around 35”, and a large percentage of halibut we catch fall within the 35”-38” range. If we couldn’t keep fish in this size range, a lot of halibut would be going back this year. This slot limit applies to guided sport halibut charters in area 2C, which is anyone fishing for halibut in Southeast Alaska and includes the Ketchikan area. Sometimes stricter regulations tick me off; but when that happens, I need to take a step back and look at the big picture. If we don’t protect these fish, they’re not going to be around. wearing the sweatpants (It was the 90’s). Halibut have a special place in my heart. 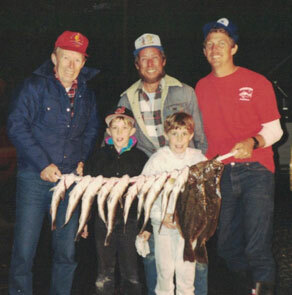 My family fished halibut before I was born and some of my earliest memories involved halibut fishing. My first time fishing halibut, my dad, my two uncles, my twin brother and I went halibut fishing out of Marina Delray in Southern California. We were fishing offshore, and though my parents tell me I was conceived on a boat in the same area, it was the first time I can remember being on the ocean. Right from the start, we had a hard time getting our lines to the bottom because a large school of mackerel was ferociously taking the bait on the way down. My brother and I were having a ball catching the little mackeral, but the older generation of fishermen were getting irritated. At one point, I remember my normally mild-mannered dad cursing a mackerel as he smacked it against the side of the boat. My brother and I were overjoyed at the non-stop action; we were catching fish, why was everyone else upset? This went on for a few hours before we attracted the attention of a giant sea-lion who had learned to follow boats around looking for an easy meal. When the bugger grabbed a mackerel I had pulled out of the school, I had no idea what was happening, I just knew that something tremendous was pulling all my line off the reel. My uncle, knowing right away that I was on my way to getting spooled, immediately cut the line with a knife. They had to explain it to me, I didn’t know what happened. Later on, amongst the maceral onslaught, I was reeling in another fish and the thing started aggressively pulling line off the reel. I started screaming “Cut the line! Cut the line!”. My Uncle Dave replied, “Screw you.” I was bewildered by the situation, but I started slowly gaining on whatever it was. After what seemed like a very long time, I saw an unusual fish coming up out of the emerald green deep. At that point, I knew it wasn’t another sea lion, and I was amazed when my uncle savagely gaffed it and plopped it on the deck. Everyone but me cheered. So that’s a halibut? I realized that up to that point, I didn’t even know what the heck we were fishing for. I was happy with the mackerel, but this halibut was incredible to me. We finished the day catching a hundred or so mackerel and a nice pile of sea bass; I caught one more halibut. This time, I knew what it was as it took its first dive and started pulling drag; and I was beside myself with excitement. At the end of the day my brother may have been a little upset that I caught the two halibut of the day and hooked the only sea-lion, but I remember how proud my dad was. When we got the boat cleaned and put away, the entire family met at my grandma's where we celebrated the successful day by frying up our fresh fish. This was my first experience halibut fishing, my first time hearing my dad swear, and the first time anyone ever said “screw you” to me. It was a monumental day of firsts, and halibut fishing has been in my blood ever since. Twenty-five years later, I still vividly remember the mackerel, the halibut, and the sea-lion; but most importantly, I remember the wonderful time we had as a family. My dad has since passed away, and my uncle has since sold his boat and moved to Arizona; but while life is constantly changing, memories like this always stay with you. For me, this encapsulates the true essence of fishing. I hope to one day create these types of memories for my children, and it’s our regulations that keep me optimistic. Pacific halibut are fortunate that fishermen have learned from past failures and are applying their knowledge to protecting the halibut population. While there are three distinct species of halibut, (Atlantic, Pacific, and California) only the California and Pacific halibut have steady numbers. Atlantic halibut haven’t been so fortunate. Atlantic halibut are found on both sides of the Atlantic from Virginia to the United Kingdom, but are considered an endangered species due to hundreds of years of unregulated fishing; lessons learned at the expense of this species are being applied to West Coast fisheries, which have made organizations like the IPHC possible. The International Pacific Halibut Commission (IPHC) is responsible for protecting Pacific halibut from Southern California all the way to the tip of the Aleutian Islands including; Alaska, British Columbia, Washington, Oregon, and California. This is a huge area, but it is only part of the tremendous range of the Pacific halibut. They range down the coast of Russia to the coasts of Japan. While the IPHC doesn’t include Russia or Japan at this point, it does ensure all of the fishing regulations throughout northern America work together to protect the resource. The IPHC is an international treaty amongst Canada and the US making halibut one of the few federally regulated fish in our area. It’s no surprise to me that outdoorsmen are usually ardent conservationists; we love the wild, and most are fascinated by the vast intricacies of its inner workings. From its lifecycles to the incomprehensible food webs, the wildness of the ocean is something we can touch, feel, and eat. Nevertheless, regulations sometimes feel like a double-edged sword; while they do limit something we love, they also ensure the future of this passion for future generations.